Great summer treat! Tropical Ice Pops or a smoothie for those hot summer days! 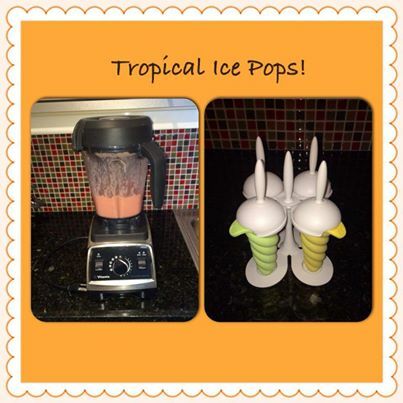 You can have a delicious tropical smoothie and save some to make ice pops and eat later on during the week. Ice pops are a great healthy snack option. Get more fruits into your daily diet! 1 tbsp raw honey. *optional. Blend in a high speed blender. Serve and enjoy! Tip: If you want your ice pops to come out softer try adding a little bit of sugar. Honey should also make them softer but sugar works best. The ice pops will not come out “rock hard”. If you would like to purchase good quality ice pop molds, click on the photos below for information and where to buy. Great size for a small child and very easy to clean! They are super easy to peel off too! (the silicone ones are easier, the others you need to run a little hot water before peeling off) I have tried them all. These are my favorite molds!